I have not been watching "Jaws." I have not been watching documentaries on Discovery Channel. I am not on drugs of any kind. Any of these would explain my dreams last night. I dreamt I was standing on an observation deck at the top of a cliff, watching many boaters and surfers in the waves. Then one of the boats capsized. I saw the three people swimming away, all in different directions. One made it to safety in a cove off the cliff where there were other people hanging out. I then saw a huge, ominous, dark shape underneath one of the swimmers. 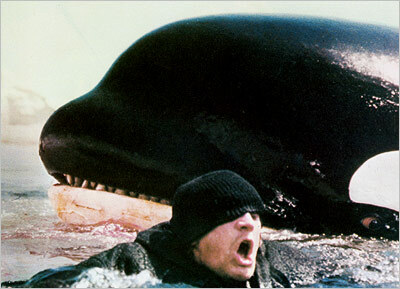 The man was screaming as the killer whale broke the surface of the water, grasping its victim, and hurling itself into the air whilst biting the man in half. Everyone else observing was aghast, yet it was almost as if we were watching a movie - with people saying, "Oh my, did that whale just eat that man?" Uh, a little more drama, please! This whale was also unlike any other killer whale I've seen - it was more of a Megalodon in size - ginormous. The whale then devoured the second person in a similar fashion. I woke up before the second boat of capsized people could be eaten. I usually dream about sharks - they scare the snot out of me, yet I can't tear myself away from Shark Week, stupid shark movies, photos, you name it. This, however, is my first time with killer whales. I wonder what it means? Whale: The whale represents Self-awareness. To dream of a whale indicates a healthy ability to see the spiritual side of your waking existence. It may also imply that there is an aspect of your life, perhaps a project or personal relationship that has grown to large for you to easily handle. Killer: A killer in dreams represents the eradication of an important part of your emotional self. You may be at risk of losing who you truly are. A killer in dreams may also represent the opposite; that is, that a healing time in your life is about to begin. You have recently taken the opportunity to speak up for yourself and stand up for what you believe in, ending a situation in a dramatic manner. Orca: The presence of an orca in your dream symbolizes doubts and disbelief in motives. Yeah, so either you are eradicating your Self-awareness and the spiritual side of your waking existence, or you are eradicating a relationship that has gotten too big to easily handle. Or it could be the opposite of either of those. Or you dramatically stood up for yourself and what you believe in as far as your spiritual waking existence is concerned. Or you stood up dramatically for a relationship that has grown too large to easily handle. Wow. This is kind of a fun game!